Scaffolders design, construct and remove scaffolding around buildings and other structures such as bridges. Chances of getting a job as a scaffolder are good due to high demand for scaffolding for construction. 3-5 years of training usually required. Pay for scaffolders varies depending on experience, qualifications and location. Pay rates in Auckland and Christchurch may be higher than the rest of the country. Scaffolders in training can expect to earn minimum wage or a little more. Scaffolders with initial scaffolding qualifications usually earn $20 to $25 an hour. Those with further scaffolding qualifications can earn $25 to $35 an hour. Scaffolders working as supervisors or foremen can earn $30 an hour or more, which is usually paid as an annual salary. Source: Scaffolding, Access and Rigging Association of New Zealand (SARNZ), 2018.
lead teams of scaffolders, labourers and trainees. how to drive forklifts and trucks. travel locally to sites, and may travel further for some large jobs. Brant: Ah, gidday, my name’s Brant Shortland, I’m from Whangarei, I go to Kamo High School, and I’m interested in finding out about scaffolding. Clinton: Brant’s headed to Northland Scaffolding, in Whangarei. The company’s four crews provide a service from Warkworth to the far north. Chris Douglas is the managing director. Chris: [handing Brant a shirt] It’s a nice orange shirt. Chris: Scaffolding as an industry is an interesting job. You’re always on the move. You’re going to different sites, different areas of the country, every day. You’re in the fresh air, you’re enjoying the environment around you. You’re generally working with a good bunch of people in the construction industry. Brant, when you normally start in the scaffolding industry, one of your first tasks you’d be expected to do would be work in a yard situation, where you’re stacking scaffold, you’re servicing scaffold clips, you’re painting scaffolding equipment – that’s learning about the componentry of the systems of scaffolding that you would use. Clinton: These are the components for a traditional system – tube and coupler. It’s reliable, and trusted. Chris: So here’s the basic in scaffolding equipment, tube and coupler scaffolding, which involves just your couplers, being swivel or fixed, and your galvanised tube. Clinton: This is a more recent German frame system, which is very quick to put up. Chris: Simple systems, like putting handrails together, fast-attach clips, hit it with a hammer, and you’re off onto the next one. Clinton: This ring-clamp system is fast to put together too. Chris: The system simply slots in, pin goes in, hit with a hammer and your connection’s together. Clinton: First lesson – erecting a metre-wide tower, using both old and new systems. Chris: There are two sizes on there, so grab the biggest one, and do our nut up tight. You start at the bottom level, and everybody works their way up. Don’t expect to be jumping up on top of the scaffold, and building the scaffold, in the first week. Ok – we’re going to join these two tubes together with a horizontal tube. Do it up nice and tight, push it down. We want to do that bolt up now, and do up our doubles. And that’s your finished product! Now we’re going to show you an example of the slightly more modern system. If you pick up one of those, we’re going to put it in as we did last time with our tube, we’ll grab one of our transoms, and locate it on the inside. It goes into the slot, and we grab our hammer, and we give it just a quick tap. It’s a good physical job. It keeps you in great shape. It’s like a workout – every day the boys come to work, it’s like a workout. They’re lifting steel products all day every day, so there’s a lot of them in pretty good shape. Clinton: So, time to look at some jobs. First to a supermarket site where scaffolding’s being built right along the new front of the building. Chris: It’s quick, and very versatile. It’s easy to put up, it’s a straight face, big long face. Nice safe systems, internal access, hatchways – you haven’t got the old ladder on the outside of the scaffold, having to try and crawl back in. Clinton: This construction site in Whangarei is a new road bridge. Alongside there’s a temporary footbridge, constructed entirely with scaffolding. Chris: It’s created a pedestrian access, with nice good grip, from the deck, an access way while they’re building the bridge. And over here we’ve got a hanging scaffold off the side of a bridge. For obvious purposes we can’t build the scaffold in the sediment – the risk of floods etc, so we’ve created a series of structures across the bridge to hang the scaffold down the side of it. Clinton: Equipment’s being loaded for a house that’s to be re-roofed. In charge of the team is Darren Baillie. Chris: Darren, I’d like to introduce you to Brant. Clinton: Brant is heading off to build the scaffold that will surround the house. Darren: The first thing we’re going to do, is we’re going to walk around the house. We’ll have a look at where the scaffold’s going to be built. Basically, what we’re going to be looking for is hazards that we might come across today. Things like the hose on the ground there, we’ve got power lines up here. Clinton: The gear needed is walked on to the site, and the job can begin. Chris: You’ve got three or four guys on site. You’re there to help each other. It certainly balances. You create good relationships because you’re working closely – from the man on the ground who’s taking the gear off the truck, handing it to the people who are building – it’s a link. If one person doesn’t connect in that link, then the whole process falls apart. Maea: Training for our scaffolding trainees is more than just learning about nuts and bolts. It’s from myself as the area business manager, it’s supporting our trainees, in all facets of their training so that at the end of the day they’ll complete their training on time, and come out absolutely confident and able to do their job. Clinton: Kurt Douglas is an apprentice with Northland Scaffolding, and is enjoying the job. Brant: What do you like about it? Kurt: The physical side of the work. You’re always lifting and sweating, man, you’re always sweating! Outside every day, always doing something different. Clinton: When working at height, safety is paramount. Whenever there’s a vulnerable situation, a harness needs to be worn. Darren: What you do is, you attach the hook here – it opens like that. What you do is you attach it to something above you. Never attach a lanyard below you. Chris: There’s neat people in this industry, the construction industry. Generally people that are positive, they’re progressive, they’re building things, and whether you want to follow the field, to come through to become an advanced scaffolder, or whether you want to own your own company, the opportunities are endless in scaffolding. Well done mate, good effort. Brant: It’s been pretty good, eh. I had a good experience here. Meeting new people, it’s just been an all-round good experience. Clinton: There are no entry requirements, but to become qualified, you must do an apprenticeship. Various New Zealand or national certificates in scaffolding are available and The Skills Organisation provides training support. You need to be fit, like the outdoors, be not afraid of heights, and will train on the job. The big increase in residential and commercial construction in Auckland and Christchurch means job prospects are good. 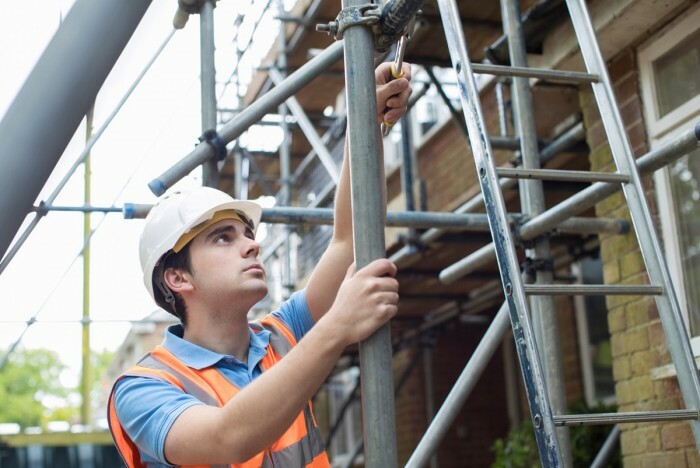 To become a scaffolder you need to start as a trainee under the supervision of a qualified scaffolder and gain a New Zealand Certificate in Scaffolding. New Zealand Certificates in scaffolding are available at Levels 3, 4 and 5. You can complete an apprenticeship to gain these qualifications. Industry training organisation The Skills Organisation oversees scaffolder training and apprenticeships. No specific secondary education is required for this job, but construction and mechanical technologies, mathematics and English to at least NCEA Level 2 are useful. A good scaffolder has to be able to interpret the customer's needs, design the scaffold and build it efficiently and safely. high turnover of new trainee scaffolders because of the very demanding physical work. Over 60% of scaffolders are under 35.
the Christchurch and Kaikoura earthquake rebuilds, which are predicted to continue at the current rate until 2019, then taper off to 2022. There are 1,100 scaffolders working in New Zealand, but there are not enough to meet the demand for their services. As a result, scaffolder appears on Immigration New Zealand's immediate skill shortage list and Immigration New Zealand's construction and infrastructure skill shortage list. This means the Government is actively encouraging skilled scaffolders from overseas to work in New Zealand. Like many building jobs, this role can be affected by economic conditions. A downturn in the economy can lower demand for scaffolders, especially those with fewer qualifications. having a heavy vehicle licence. Scaffolders are also needed for work on power stations and offshore oil and gas platforms, such as Marsden Point and Taranaki's Maui gas field. Scaffolders mainly work for private scaffolding companies. These range from businesses with just a few workers to nationwide companies that employ hundreds of staff. BRANZ and Pacifecon, 'National Construction Pipeline Report 2017, 5th Edition', July 2017, (www.mbie.govt.nz). Burke, G, chief executive officer, Scaffolding, Access & Rigging New Zealand, Careers Directorate – Tertiary Education Commission interview, January 2018. Scaffolders may progress to set up their own scaffolding business or move into scaffolding team leader or management roles, or construction management roles. Scaffolders with a New Zealand Certificate in Scaffolding (Level 5) can move into civil engineering work. Crane operators use cranes to move objects such as materials on construction sites, containers on wharves, and heavy parts in factories.